As customers and businesses seek better environmental practices and fair labor standards, corporate social responsibility (CSR) reporting has taken on greater importance for executives who could face questions about why they use conflict minerals or buy products created by forced labor. To help take a deeper look at the issues, EcoVadis has assessed the CSR reporting of more than 33,000 companies around the world. The Paris-based company is a provider of business sustainability ratings, intelligence and performance-improvement tools for global supply chains. 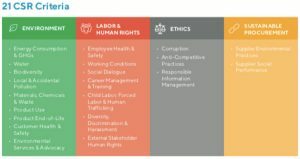 EcoVadis found trends and risks associated with nine industries that could help executives be more transparent about their businesses’ practices and mitigate any risks that would harm a company’s reputation and bottom line. 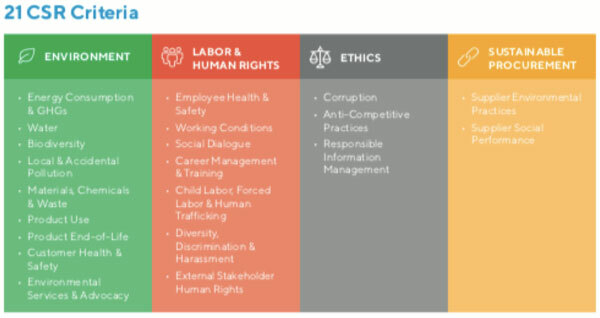 This is EcoVadis’ second Global CSR Risk and Performance Index, which measured 21 criteria across four themes: environment, business ethics, sustainable procurement, and labor and human rights issues. 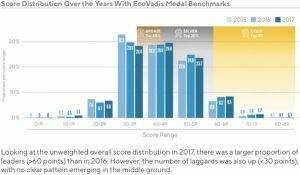 On the study’s 100-point scale, no companies scored in the 90s, which would indicate an outstanding level of reporting, but EcoVadis says scores around 75 show an advanced level of CSR reporting on the criteria it assessed. Scores around 50 reflect that companies are confirmed to be engaged in assessing the main criteria. Results below 45 indicate “an unstructured approach” to CSR management, and scores around 25 show that the criteria are partially or not sufficiently addressed. 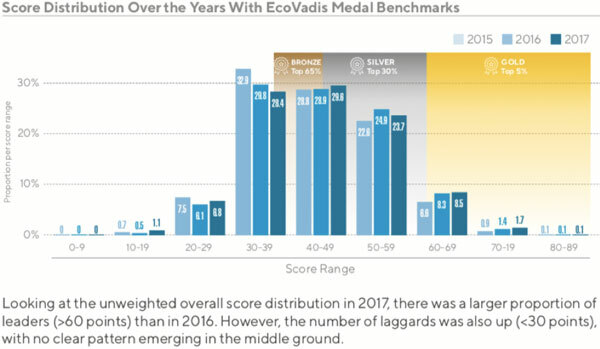 An earlier Spend Matters story reflected the study’s finding that smaller companies outscored larger ones on CSR reporting in the EcoVadis Index. But the study also took a deeper look at the results of CSR reporting by industry. EcoVadis evaluated nine industries that were grouped by business types just like the United Nations does in its system, the International Standard Industrial Classification of All Economic Activities (ISIC). The industry divisions range from heavy manufacturing to communications, but the “primary materials” sector — which includes businesses like farming, ranching, logging, oil drilling and mining — was not evaluated by EcoVadis. “Results for the primary materials division are not included due to a limited number of companies assessed, making it impossible to draw meaningful insights,” the study said. EcoVadis said it works with its customers and their suppliers to assess CSR reporting — but some suppliers in the primary materials area opt out of the study. Sheng Ou Yong, a senior analyst for EcoVadis, said in a statement that it needs at least 30 companies to agree to be assessed and that EcoVadis hopes to work with its customers to persuade suppliers to be evaluated. In this highly regulated industry, “consumers pay more attention to healthy ingredients, ecological packaging and organic products, e.g. Amazon’s purchase of Whole Foods, but are not always willing to pay for them,” the study said. “Cost pressure is high, with documented high labor turnover, high accident rates, poor working conditions and vulnerability to modern slavery,” the study said. Small and medium-size businesses in the food and beverage division had the best CSR reporting, with a top score of 46.8, EcoVadis said. This group of businesses includes makers of items like electronic boards, batteries, vehicles, domestic appliances and consumer electronics. “Large advanced manufacturing companies performed well in the sustainable procurement theme, indicating strong awareness and ability to deal with the industry’s long-standing supply chain problems,” like those related to conflict minerals, the study said. EcoVadis sees the rise of the internet of things (IoT) in products as a boost to efficiency and precision — but it also will increase the risks to cybersecurity. This industry includes clothing producers, footwear manufacturers, and makers of wood and paper products. “Risk in this industry division has increased,” EcoVadis stated in its terse summary. Researchers noted the impact of the trend known as fast fashion, where clothing designs go from the catwalk to retailers much faster than in years past and often with less quality. “Textile and fabric industries continued to be exposed to fast-fashion cost models, which disincentivize investments in supplier capability building and in scaling up ‘greener’ materials, despite consumer demands for ethical fashion,” the study said. Deforestation has led to ecosystem losses that are estimated at $2 trillion to $5 trillion a year, the study said. And researchers said major CSR issues associated with light manufacturing businesses are social and human rights abuses as well as excessive water and energy consumption. Companies in this sector improved in 2017, which indicates a commitment to CSR issues, the study said. Researchers said the rise of 3D printing and big data analytics could change heavy manufacturers’ products. “There is significant potential to reduce waste, energy use, and health & safety incidents, with higher manufacturing precision,” said the study, which also said that the industry contributes to plastic pollution in the oceans and that there’s consumer pressure for alternatives to plastic. This industry was called the most accident-prone in the study. Researchers said technology like drones, 3D printing and augmented reality could help curb accident rates as well as cut down on wasting materials. The CSR risks associated with this division are “generally significant,” the study said, and include pollution, worker health and safety accidents, child and forced labor use, and corruption tied to the acquisition of land rights and approval of permits. Large companies in this sector had the CSR index’s lowest score — 39.6. The study said developments like blockchain could help this industry improve. This industry had the highest CSR score in the business ethics category. The study said that development shows proof of leadership and that “the industry looks poised to manage compliance with EU GDPR,” the rules on concerning collecting personal data online. Firms in this sector “were able to deal with corruption and information security issues better than other industries,” the study said. But CSR management can focus on issues to help foster minority hiring and to address gender pay gaps, the study said.